In this post we take a look at the use of fire-rated fittings or fire-hoods on your projects. 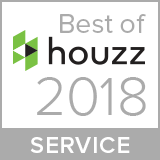 Before we start, it’s important to emphasise there are grey areas when it comes to interpretation of fire regulations, we strongly recommend you consult with local building control from the outset of your project. Fire-rated fittings generally have a ‘can’ or cover over the back. They contain a sheet of intrumescent material that expands to form a seal in the event of heat, which covers the ceiling hole to stop the passage of smoke and flames. Fire-rated fittings should have been tested and approved by an independent test house, such as BRE. 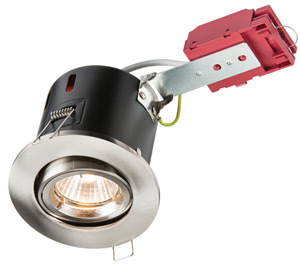 Unfortunately the range of fire-rated downlights is relatively limited, so other methods of maintaining fire-ratings can be worth considering. If a down light is not fire-rated then a fire-hood can be used. 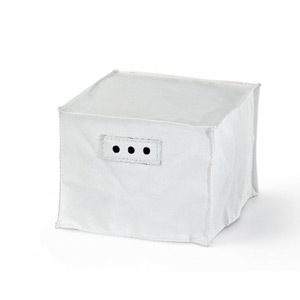 A fire-hood is a tent, made from intrumescent material, which encloses the back of the fitting, again expanding when heated to cover the ceiling hole. Using fire-hoods can pose some issues. Although (when installed correctly) they’re good at preventing the spread of fire, they’re also very good at preventing air circulation, trapping heat behind the fitting, which can significantly reduce the lamp life and output of an LED. If the LED reaches a critical junction temperature, then it will over-heat and fail. Fire-hoods are also difficult to install correctly because generally they need to be fitted through the ceiling hole from below. Instead of fire-hoods a firebox can be constructed around the fitting from the same fire resistant material as the ceiling (typically plasterboard), although this method will only work if you have access from above each light fitting. Why do you need fire-rated light fittings? There has been some misconception that fire hoods were necessary for halogen light fittings due to how hot they get and heat produced by the light bulb – This is not the case. Fire-rated fittings are sometimes needed to maintain the integrity of fire-rated barriers or compartments within buildings. Typically 30 or 60 minutes of protection is required between areas (time it takes for fire to spread from one space to another). Plasterboard provides a natural barrier to fire, with single or double layers generally providing sufficient protection to meet these requirements, however, cut-outs or holes within a ceiling, for recessed downlights, can be a weak point and enable fire or smoke to escape into other parts of the building from. Where do I need fire rated lighting? This is set out in Part B (Fire safety) of Building Regulations (http://www.planningportal.gov.uk/buildingregulations/approveddocuments/partb). In dwellings, it describes certain floors, walls, and ceilings that are required to be ‘fire-separating elements’. Fire separating elements are defined as “A compartment wall, compartment floor, cavity barrier and construction enclosing a protected escape route and/or a place of special fire hazard”. 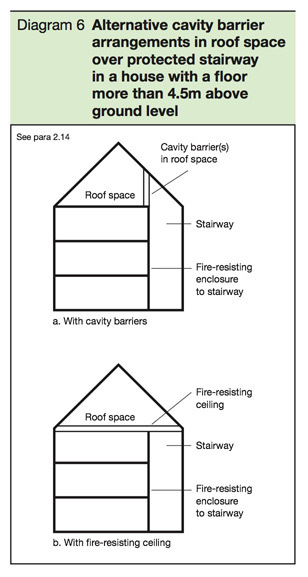 This suggests if you’re planning to recess lights into a garage ceiling (when integral to a house), or ceilings in top floor rooms (houses with floors above 4.5m and no cavity roof barrier), then they will need to be fire-rated, if there’s no other fire separating element above. It could also be interpreted that other ceiling areas are ok for use with ‘standard’ downlights. The key word here is ‘integrity’. If plasterboard (as previously mention is typically the case) provides a natural protection to a minimum of 30 mins, will cutting out holes ruin the ‘integrity’ of the plasterboard? How many holes are you planning on cutting? Ultimately it’s down to the building control officer. There’s some debate around the risk of fire-spread posed by cut-outs for light fittings, and we question the effectiveness of fire-hoods as we rarely see them installed correctly, but to mitigate responsibility, many contractors tend to err on the side of caution and install them any way.